Fun from head to tail, it features a playful poem celebrating the special gift that is a rescue pet. Your four-legged family member makes you so proud, and this colorful kitchen towel proves it. 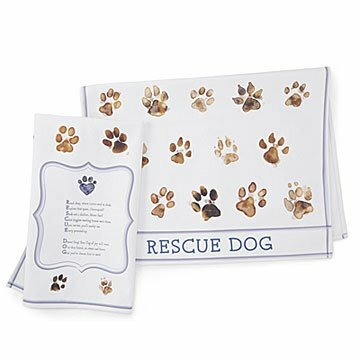 Fun from head to tail, it's decorated with "muddy" life-size paws and a playful acrostic poem celebrating the special gift that is a rescue pet. Our favorite detail: Each paw print is unique, just like the sweet furball you brought home. Poems by Martin Geller. Made from cotton in Brooklyn, New York. $2 from your purchase goes to Rescue City, a pet rescue, rehabilitation, and adoption non-profit in the New York City area. Also check out our Rescue Pet Custom Photo Pillow. The recipient of this gift has rescued many dogs over the years. She was delighted by this gift.